So the players are "agitated" that the BCCI is not soliciting their considered opinions before entering into sponsorship agreements. What's new you ask? What's new is that there is a hot-headed firebrand in the upper echelons of the current BCCI regime that does not seem to think twice before spouting inflammatory and ill-judged opinions to journalists. Backtracking just a little, the players are unhappy that the BCCI has signed an agreement with Pantaloon to supply Team India's formal wear. 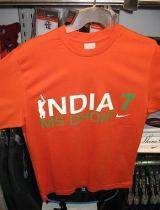 No doubt the contract between the BCCI and Pantaloon allows the use of Indian players to promote the brand. The article does not discuss the exact point of difference on this issue, but does state this beef is one in a long list that includes the Nike deal where players are forced to wear the Nike swoosh on their trousers, a spot usually reserved for the logo of their individual sponsor. To further complicate the issue, Nike is now using the player's names and numbers on T-shirts (not replica India shirts) sold to the general public (image courtesy CricInfo). In American sport, which defined the model that all other sports now follow, a player's name and number belongs to him/her, not the team or the administrative body/employer. This model has been copied by football, rugby league and even by the other cricket Boards. For example, Adidas can use the name "Ponting" and the number "1" on replica Australian shirts, but cannot sell another item of clothing with these specific details alone, because Ricky Ponting is contracted to Kookaburra for apparel sponsorship and not Adidas. Just the same, in television advertisements Ford, the new sponsor of the domestic one-day competition in Australia, must use at least four (instead of just one) Australian players in an advertisement so that it does not imply that any of the players are individually endorsing the brand, if they do not have a personal sponsorship arrangement with the company. I do not understand how the scenario would be any different with the Indian model. If this is the case then Nike would be deemed to be in breach of their agreement by using individual player names and numbers on items other than the official replica kits of Team India. The Board has illegally sold the player's personal property (eg. names and numbers), because this is something which it would not ordinarily own. The BCCI is milking the players for all their worth creating a great deal of mistrust, hardly the perfect foundation for a healthy commercial relationship. The BCCI is yet to realise that it is making these huge sums of the backs of the very players who its is trying to spurn and/or subdue. In his response to the players' qualms, Lalit Modi has opined that the BCCI owns all player "attributes"; that there is no clause in the players' contracts which stipulates that the Board must contact them before it signs any agreements; and that the players should be happy with all that they are given and stop being greedy. Modi may be an astute businessman and he has, undoubtedly, played his part in helping the BCCI acheive its current financial strength. However, I find it hard to believe anything that he has put forth in the Board's defence on this issue. Firstly, I cannot see how the player's legal counsels would have allowed them to sign away their personal attributes, such as names and numbers, for that is their brand that they have played hard to build. Secondly, the BCCI may not have to consult the players before signing sponsorship agreements, but they cannot legally sell what is probably not their asset, in the first instance (ie. player attributes). Thirdly, IMHO players are absolutely entitled to fight for every last cent that is earned by the BCCI, because it has been earned off their sweat. Modi and his cohorts are not on the field baking away in the hot sun, copping thunderbolts from bowlers trying to take their heads off. Of course, I am not privy to the exact clauses of the agreements between the various parties, however, I do not, for one second, believe Modi has a leg to stand on with his latest rant. Lalit Modi makes degrades himself and the BCCI by "thundering" to journalists in this manner. Its blatantly obvious, that journalists dial his number first when there is a potential issue brewing, because they know there will be a sound-bite, or three, at the end of the call. What on Earth is Sharad Pawar doing by allowing this menace to babble inane, probably inaccurate, rubbish? The team gets a Media Manager when they travel, the BCCI is in greater need on right now, especially if Lalit Modi continues to have anything to with its functioning. This saga, more than anything else, should prove the pressing need for a Player's Association that represents their interests at every corner. It is quite clear that the people who matter within the BCCI do not give two hoots for the player's interests. These men will auction off the players at the mere sight of an extra buck, all in the name of advancing the cause of cricket. Please, save me the propoganda. Get your act together boys, otherwise you will have no more than the shirts on your back - not even your names. Comprehensive write up. BCCI is doing nothing but bullying the players. Gavaskar and KApil Dev were perhaps the only ones who could stand up to them because of their stature. Sponsorship should be decided by market forces on individual players depending on their performances. Team sponsorthip is a lot of nonsense. They are bullying them, no doubt and Mr L Modi has no small part to play in these tactics. The players will achieve nothing without a player's association that is headed by a strong-willed and intelligent person (not necessarily a former cricketer) who is not worried about telling Modi and his ilk where to stick it, if the situation demands this approach. It seems more like a master-servant relationship as opposed to a employer-employee one. In a strange way, I think Modi might just be trying to bite the hand that fees him, which is only to his detriment in the long run. modi just wants to show that he can bring in more moolah..he seriously needs some lessons on handling the media. He is offensive and at times even rude. He doesn't need any lessons. He needs to be kept away from the media. There are plenty of other people who would be able to the same job as him, in terms of moolah, in a much more amicable and effective manner.